We went for a short drive today to see the Agua Mansa Pioneer Cemetery in Colton. It's located on a bluff overlooking the Santa Ana River and it provides a very peaceful setting. For pictures, click here. Today we were in Los Angeles for a tour of the Clifton's Cafeteria building given by the Los Angeles Conservancy. The building has a long history and its furnishings and decor are unique. For pictures, click here. We recently became members of the Redlands Area Historical Society and today was the first time we participated in one of their events. It was promoted as a "holiday walking tour of downtown Redlands," so we were there at 9:00 AM to check it out. It was very interesting but crowded, with about 30 people showing up for the tour. Unfortunately it really didn't make for a good picture taking adventure, so there are none to show. Today we visited an exclusive boarding school that has its own museum of paleontology on campus. 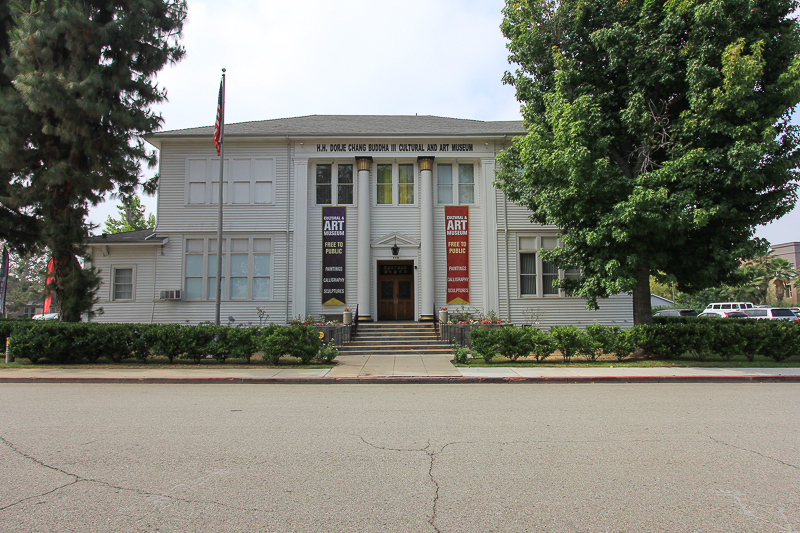 It's the Webb Schools in Claremont, CA and its museum is the Raymond M. Alf Museum of Paleontology. For pictures, click here. Today we drove over to see the holiday decorations at the Kimberly Crest Mansion in Redlands. Photography isn't permitted inside, but you can see some exterior shots in you click here. On this 75th anniversary of the Pearl Harbor attack, we drove down into the Coachella Valley to visit the La Quinta Museum. It's a great place and we enjoyed the city as well. For pictures, click here. The John Rains House in Rancho Cucamonga held their annual holiday open house today and we decided to check it out. To see how this pre-Civil War era house was decorated, click here. Today we were in the Whitewater Preserve in the Palm Springs area to enjoy the scenery while hiking through the Whitewater Canyon. It's a beautiful place that's just off the beaten path north of the I-10 freeway. For pictures, click here. We drove up into the Mojave Desert today to visit the Calico Ghost Town. We've heard about it since we moved here and today seemed like a good day to take it in. It's a fun place! For pictures, click here. The Lincoln Memorial Shrine celebrated the 153rd anniversary of Lincoln's Gettysburg Address today with Civil War era music and a recitation of the address. For pictures, click here. We had an interesting day in Los Angeles today, visiting two new places for us. The first was to see the architectural gem of St. Vincent Court in the middle of downtown and we also visited the "Skeletons in the Closet" gift shop for the Los Angeles Coroner. For pictures, click here. While Judy's up north visiting her sister, I decided to go to the Dead of the Dead festival being held today at the Bowers Museum in Santa Ana. It was an explosion of color! For pictures, click here. We took a long ride today to visit the eastern shore of the Salton Sea. Everything in that area is other-worldly. For pictures, click here. We've recovered from our colds last week, and my jury duty this week, and were able to get out once again. 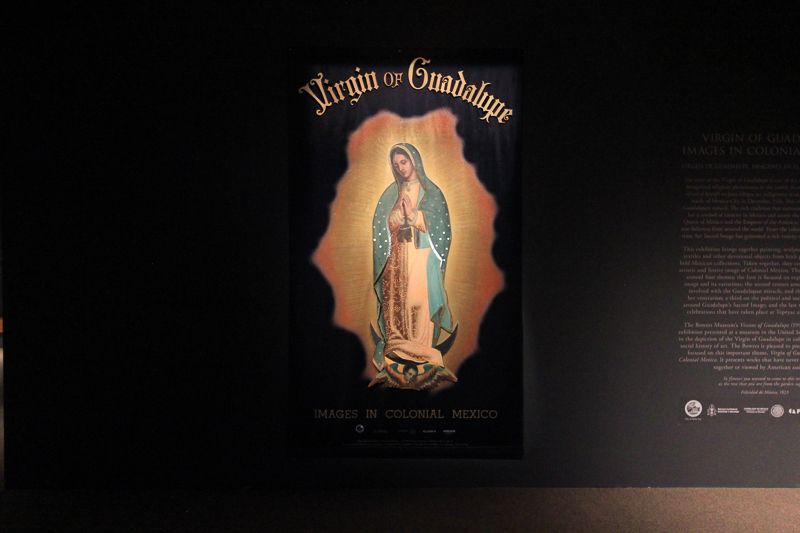 So today we returned to Santa Ana to see the Bower's Museum latest exhibit, the Virgin of Guadalupe: Images in Colonial Mexico. In the year 1531 at a sacred location known as Tepeyac Hill near today�s Mexico City, the report of one man�s vision of the Virgin Mary sparked a phenomenon of religious fervor like no other. The man, addressed by the saint in his native language, was instructed to carry a message to the bishop for the construction of a church where the Virgin�s compassion would be known. The appearance and the subsequent miracle she performed there were the first events of their kind to be documented in the Americas. Currently the Minor Basilica of Our Lady of Guadalupe in Mexico City is the most visited Catholic pilgrimage site in the world, and the world's third most-visited sacred site. Photography wasn't permitted but I did take two pictures at the entrance. We drove over to Banning today to attend the Malki Museum's Fall Gathering. The museum holds three events each year and this one is the smallest of the three. However, the food was very good and the atmosphere was enjoyable. For pictures, click here. Today we went to the historic El Pueblo de Los Angeles district to see the newly opened Italian American Museum of Los Angeles. 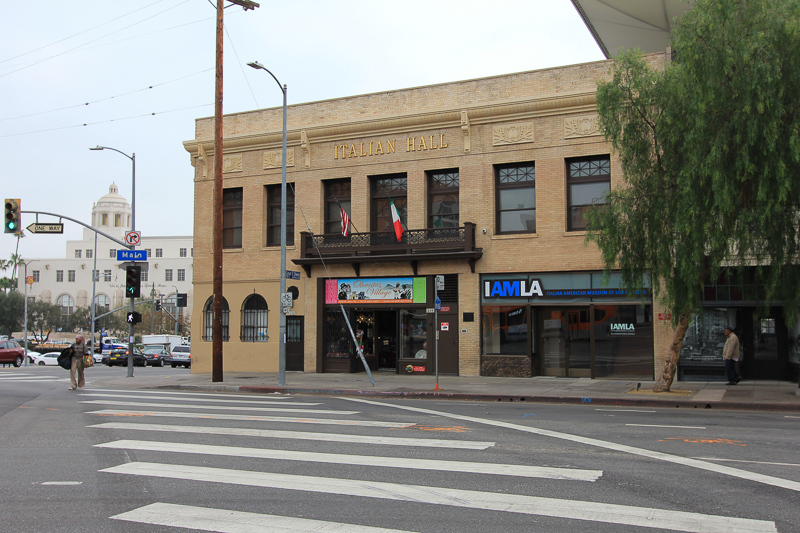 IAMLA is located in the Italian Hall, which was constructed in 1908 to serve as a gathering place for the Italian community. 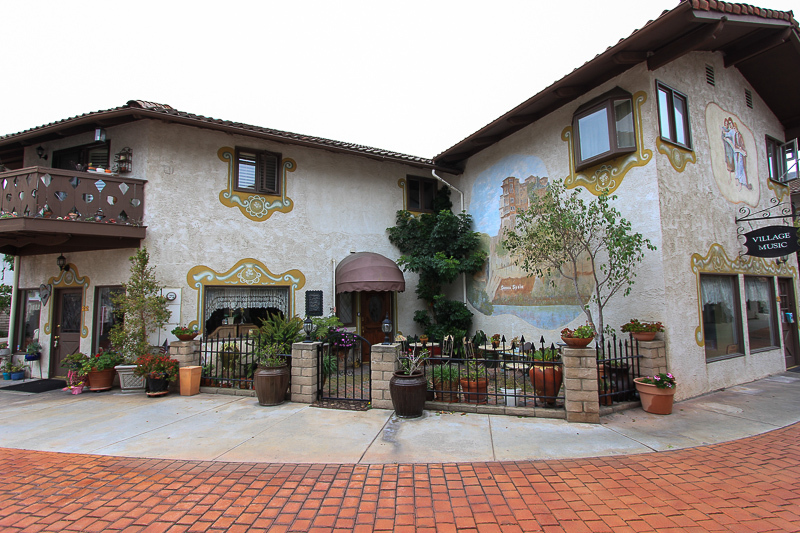 Today, the Italian Hall is the oldest remaining structure from Los Angeles� Italian enclave, and is listed on the National Register of Historic Places. The museum is small and a lot of the history is shown via large video screens, which is very informative. However, pictures were not allowed, which is always a big disappointment for me. But after touring the museum we drove to the nearby Lobsta Shack for lunch. The Lobsta Shack is the brick and mortar spin-off of the Lobsta Truck, which came about after an innocent autumn trip to New England. If you read the "About" section on their web site, you'll see that their genesis is quite an interesting story. 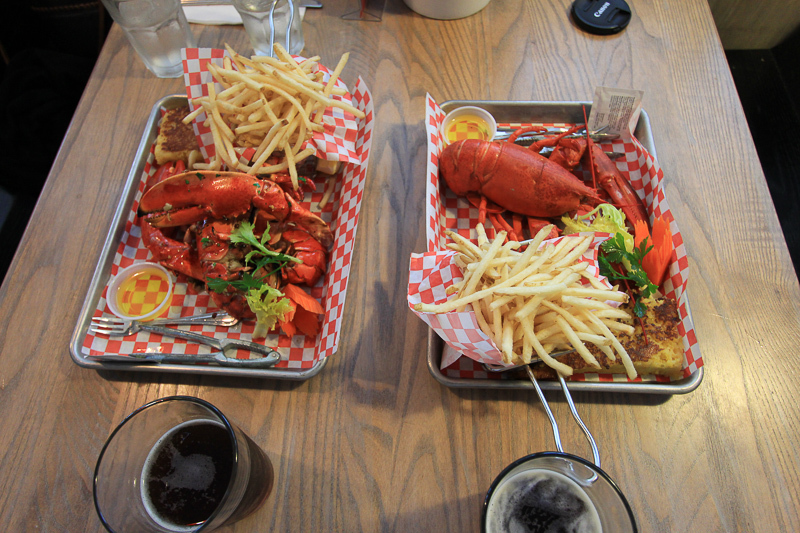 We had one grilled Maine lobster and one that was steamed. It was the best we've tasted since leaving New England. The fries were good as well, but the cornbread was outstanding. It wasn't dense, but it was moist and it was grilled in butter before it was served to us. Absolute heaven! 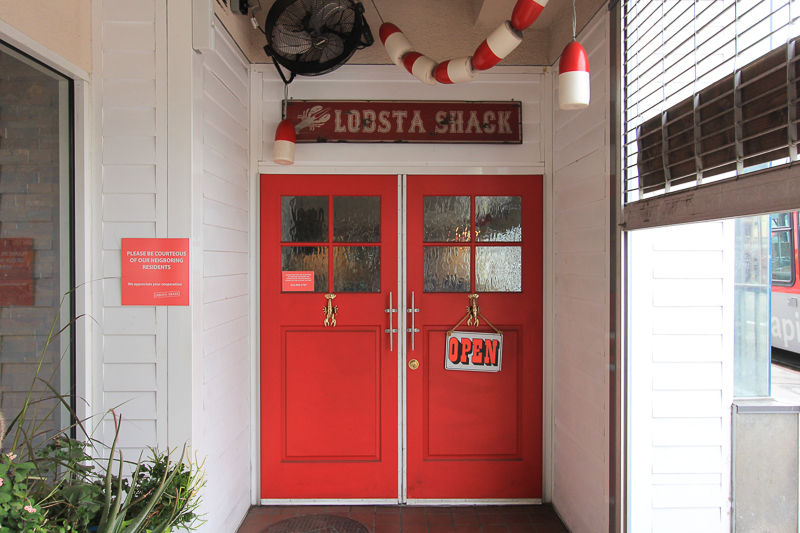 We'll be back to the Lobsta Shack again. I had a catastrophic computer failure today, but it didn't stop us from going to see the San Manuel Pow Wow in San Bernardino. For pictures, click here. 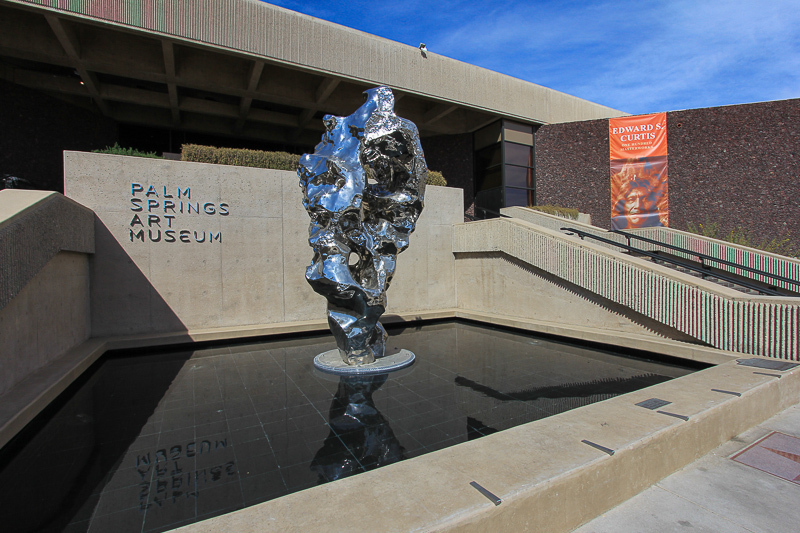 Now that the weather's cooled down a little, we headed to Palm Springs today to see the Native American basket exhibit at the Palm Springs Art Museum. For pictures, click here. We had a very interesting experience today in the Mojave Desert since we hung out with ten wolves at the Wolf Mountain Sanctuary. They're more gentle than we'd ever imagined. For pictures, click here. Today we were in Long Beach to see the new "Vitality and Verve in the Third Dimension" exhibit at the Long Beach Museum of Art. It's a great installation. For pictures, click here. 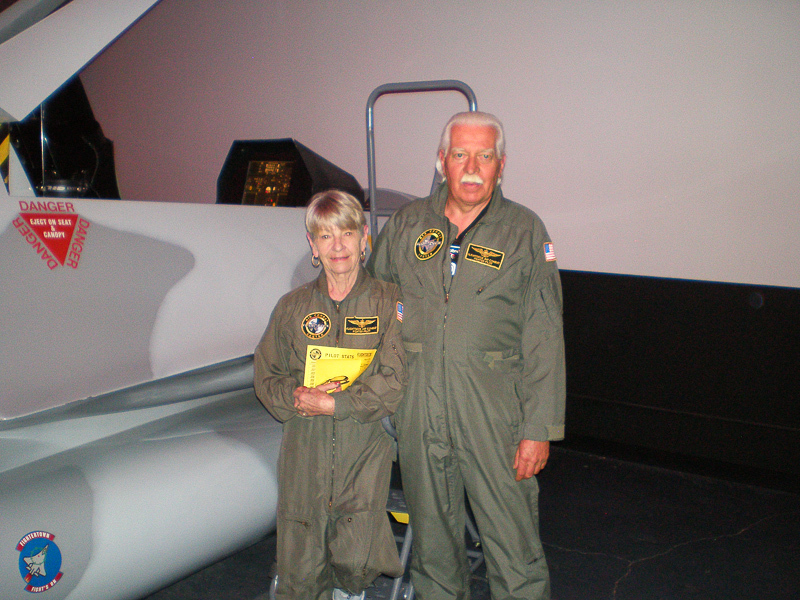 Today is Judy's birthday so we decided to go up in the world and see the new Skyspace observation deck in Los Angeles. For pictures, click here. 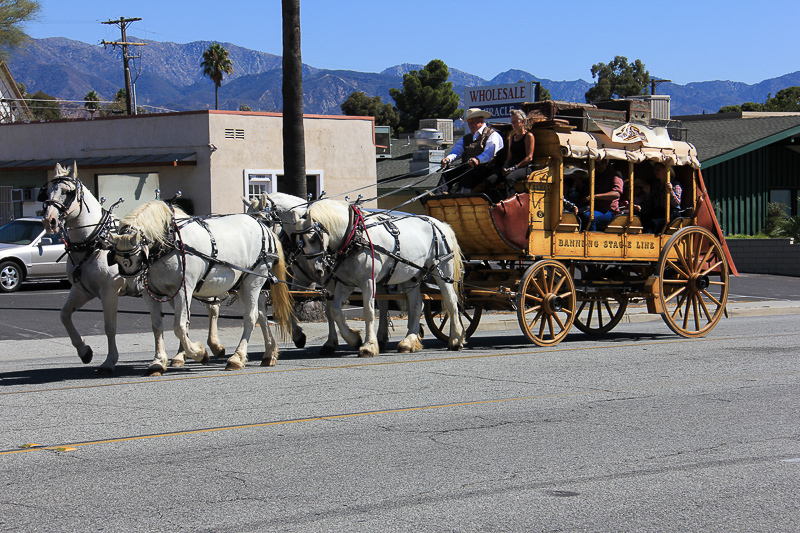 Today we were in Banning to see the parade and the festivities at their annual Stagecoach Days festival. The city is named for Phineas Banning who operated stagecoach lines in the Los Angeles area including one line between Banning and Yuma, Arizona. Virgil Earp was one of Banning's drivers, who was probably assisted by his sixteen year old brother, Wyatt. The fair wasn't that exciting but there are professional rodeos here at night, which is probably a lot more fun. We've had the Descanso Gardens on our list of places to go for several years now, but we never got there until today. It's beautiful! For pictures, click here. Today we had a wonderful day at the beach in San Clemente. We ate lunch on the pier and toured the beautiful Casa Romantica overlooking the ocean. For pictures, click here. There's a museum within the San Bernardino train station that we've known about for awhile, but never got around to see it. It's called the San Bernardino History and Railroad Museum at the Depot, and it's fabulous! For pictures, click here. We went to see the Museum of Tolerance today in Los Angeles. They have a special exhibit about the life of Anne Frank and we toured that rather than seeing the permanent main exhibit. For pictures, click here. We were in Hollywood today to visit the Mr. Musichead Gallery that currently has an exhibit of Baron Wolman's photographs that were taken at the Woodstock Music Festival in 1969. For pictures, click here. We were in Pacific Palisades to tour Will Rogers' ranch house in the Will Rogers State Historic Park. It's a beautiful park for hiking or horseback riding. For pictures, click here. We got away from the heat today by driving down to Huntington Beach to see the Newland House Museum. This Victorian farmhouse was built in 1898 and it has been beautifully restored and maintained. For pictures, click here. We were in Glendale today to visit the Brand Library & Art Center. 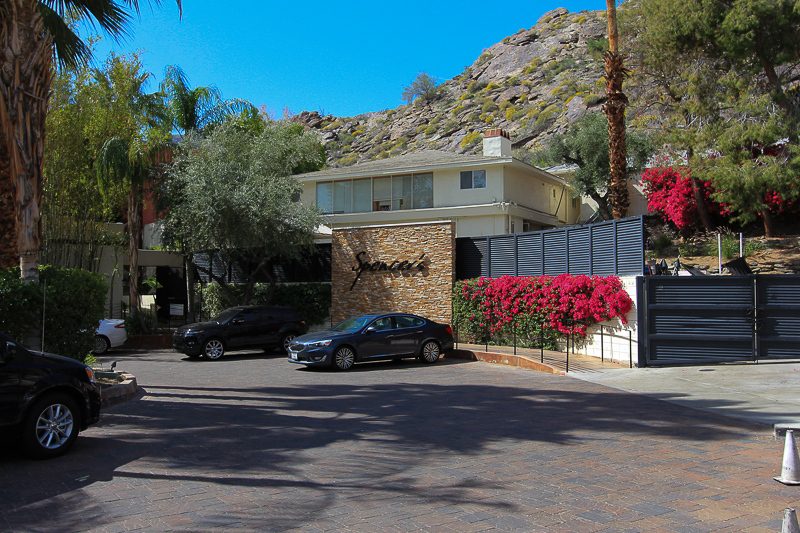 This private home was given to the city by Leslie Coombs Brand, who is often called the father of Glendale. For pictures, click here. We finally we able to get tickets for the "Rain Room" exhibit at LACMA, so we headed into Los Angeles to check it out. It is unique! For pictures, click here. Today we were in El Monte to see the museum operated by the local El Monte Historical Society. We were expecting to see a rather small museum, but we were surprised to find a very large museum in a beautiful 1936 building. For pictures, click here. We had a very enjoyable day exploring Balboa Park in San Diego. For pictures, click here. We had a blast today visiting the Museum of Neon Art in Glendale. For pictures, click here. We drove into Covina today to visit the H. H. Dorje Chang Buddha III Cultural and Art Museum. H. H. Dorje Chang Buddha III is the artist featured in the museum and the "H. H." stands for "His Holiness." He is represented to be the third living (reincarnated) Buddha by some, while others consider him to be a fraud. Who knows? There is a separate hall in the museum filled with paintings of carp that are quite lovely. 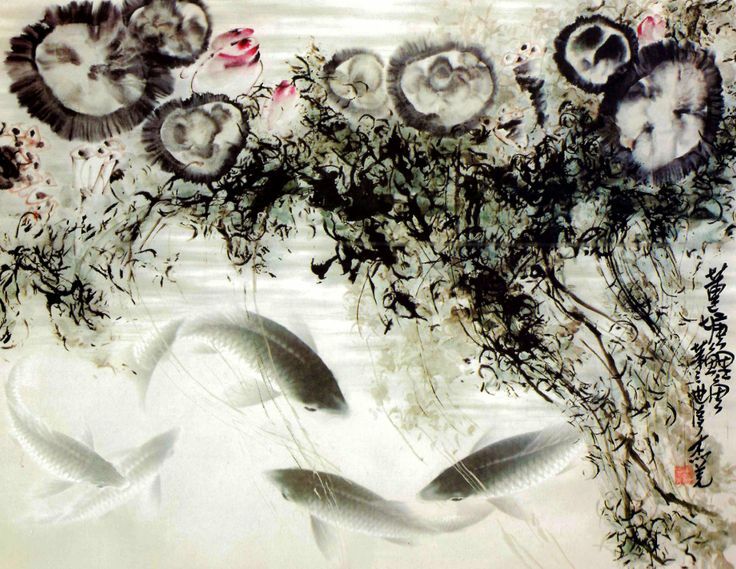 This painting by H. H. Dorje Chang Buddha III is called "Carp in a Lotus Pond," and is very impressive. Today we were in Garden Grove to see the Crystal Cathedral, now known as Christ Cathedral. This 34-acre complex is awe inspiring. For pictures, click here. We took a relatively short ride today into the mountains to visit the small town of Idyllwild. We toured the museum run by the Idyllwild Area Historical society that is located in the downtown area. For pictures, click here. In our seven years living in Southern California we have had about 250 adventures in total. Today's was one of the best. 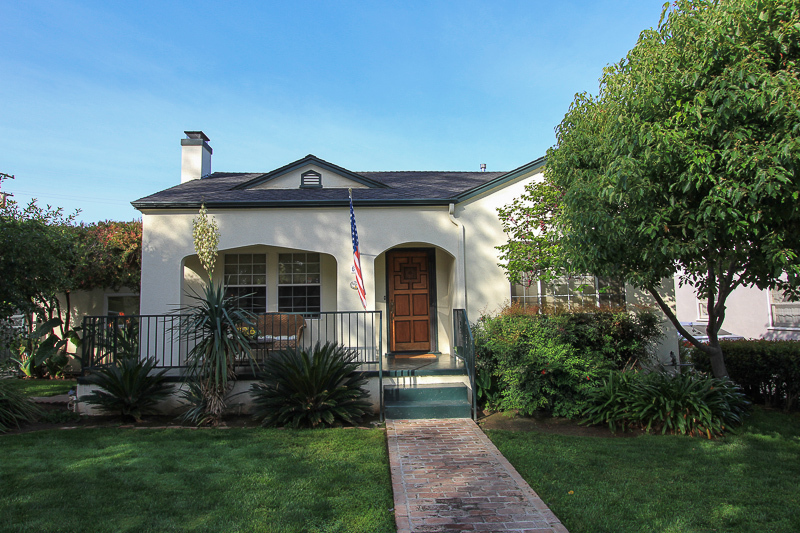 We were at the Crystal Cove Historic District in Newport Beach that is quintessential California. For pictures, click here. Judy and I had a nice relaxing Father's Day celebration for ourselves, all courtesy of Dante, he's such a good boy. 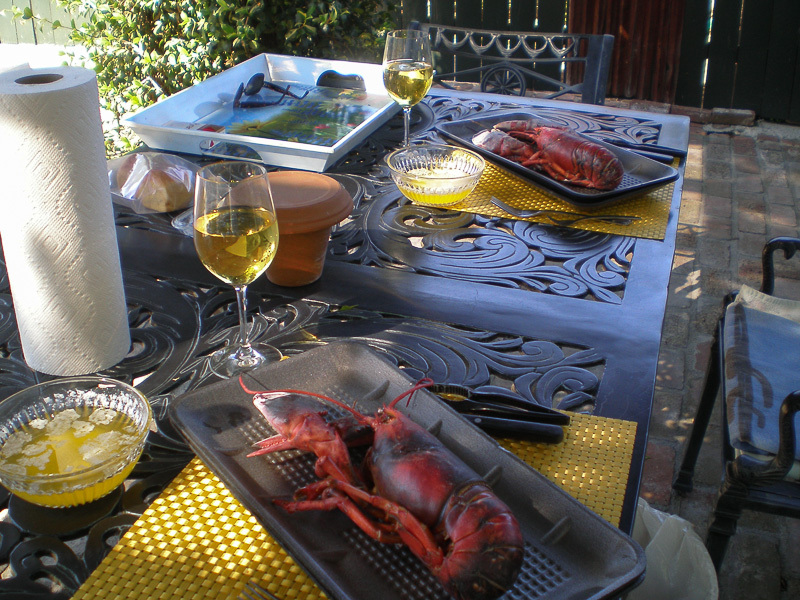 Lobster by the pool, a nice seven year old Orvieto wine, and beautiful music, followed by a swim after our meal. What's not to like? Today we were back at the Bowers Museum in Santa Ana to see their new exhibit, California Bounty: Image and Identity, 1850-1930. For pictures, click here. Today's adventure was to visit the Rancho Santa Ana Botanic Garden in Claremont. The highlight of the trip was to visit their Butterfly Pavilion that is only open during summer months. For pictures, click here. The Pala Mission had a big celebration today to commemorate its 200th anniversary. Judy and I and about 1,000 other people decided to experience it as well. For pictures, click here. We were in Los Angeles today to visit the new Broad Museum next to the Disney Concert Hall. For pictures, click here. We celebrated Memorial Day weekend this year by going to the Malki Museum in Banning for a Native American Kew�t (fiesta). It was well attended and a lot of fun. For pictures, click here. We had a very interesting and informative adventure today in the Mojave Desert. We had a long tour of the Goldstone Deep Space Communications Complex in Fort Irwin, CA. For pictures, click here. I had a solo adventure today since Judy is visiting her sister. 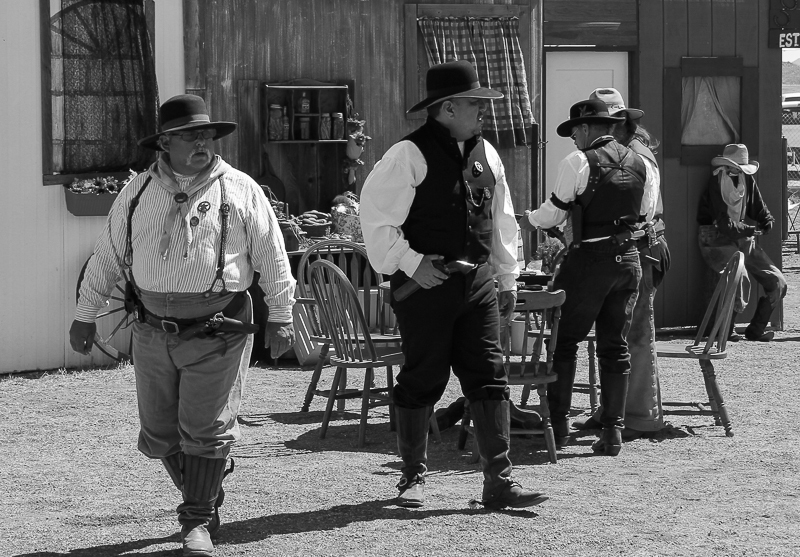 I went to Banning for the "Wild West Festival and Western Art Show" being held at the Gilman Historic Ranch and Wagon Museum. For pictures, click here. 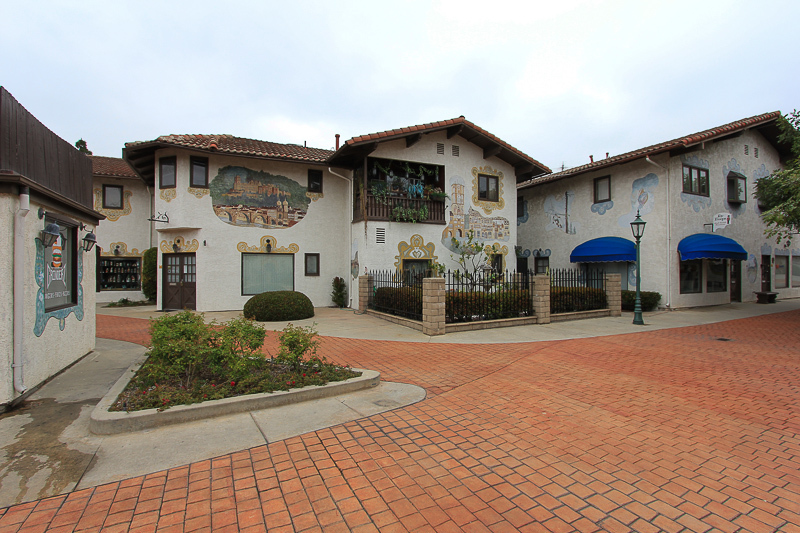 Today we went to Huntington Beach hoping to savor a slice of Germany at the Old World Village. Unfortunately it ended up being a bust. This recreation of a German village was built in 1978 with 50 homes above 50 shops in the traditional Bavarian style. It was very pretty and well maintained but most of the stores were vacant and the ones that were open weren't very exciting. It still is synonymous with Oktoberfest in the Los Angeles area and it probably is busy during that time. However in May, not so much. I went to South Carolina this week to visit my sister Nancy and we made a tour of Rock Hill, SC to see some sites there. We had a great time together and we covered a lot of ground. For pictures, click here. We drove north into Kern County today to see the town of Boron and the Borax mine there. It is huge and very impressive. For pictures, click here. We were in Orange today to see the new Hilbert Museum of California Art at Chapman University. The museum was great and so was our lunch at Watson's Soda Fountain & Cafe. For pictures, click here. Judy and I have had hundreds of great adventures here in Southern California, but there have been some disappointments as well. Like the time that we went to Highland to see their "Orange Festival," but we didn't see any oranges. Another time we went to Yucaipa to see their "Iris Festival," but, there weren't any irises. Today's misadventure brought us to Rubidoux to witness their "Butterfly Festival." Guess what? There weren't any butterflies. Sometimes you just can't win. 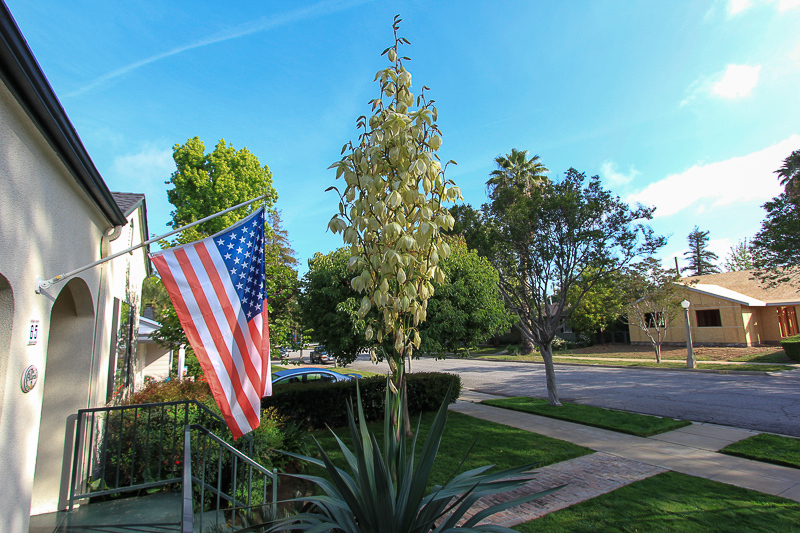 It's a beautiful Friday here and our yucca plant is blooming once again. 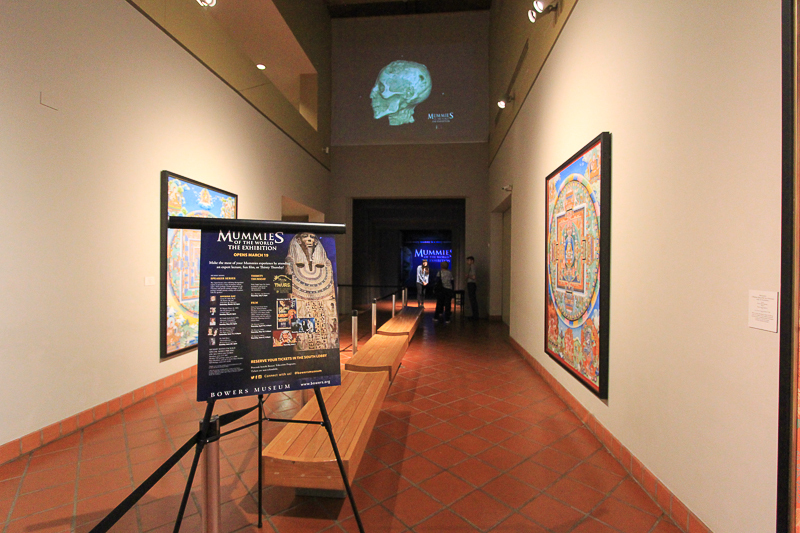 We were back at the Bowers Museum in Santa Ana today to see their new exhibit, Mummies of the World. This is one of those exhibits that doesn't allow photography, so I can only post this picture of the entrance to the exhibit. Generally speaking the exhibit was pretty interesting, as well as being pretty creepy. 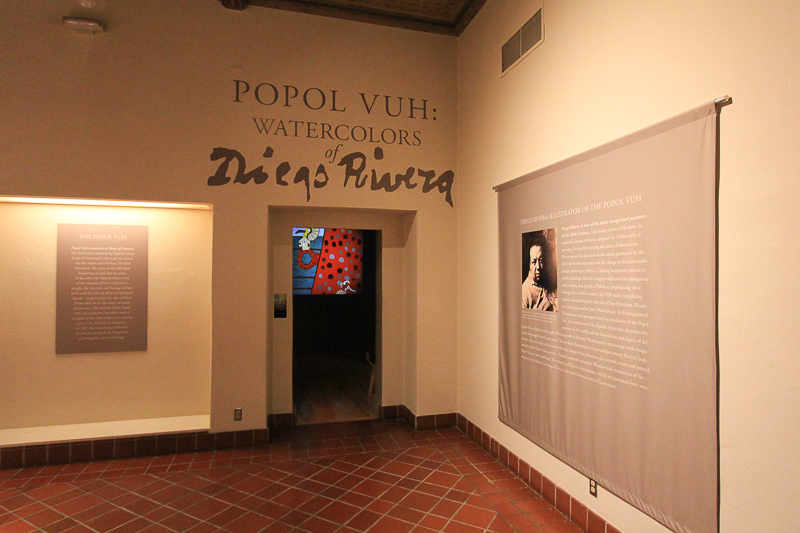 We also saw another exhibit, also one prohibiting photography called "Popol Vuh: Watercolors of Diego Rivera". 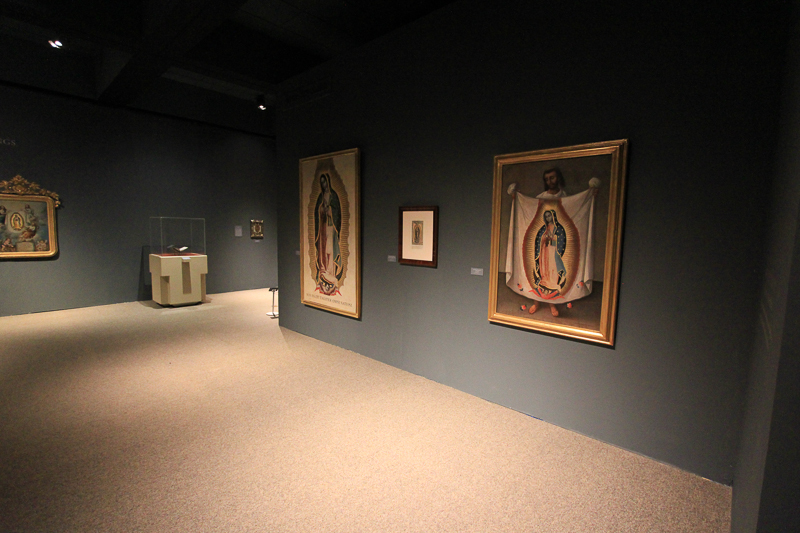 The collection was of 17 watercolors from the collection of the Museo Casa Diego Rivera in Guanajuato, Mexico. The best part of today's adventure was lunch at the Bowers' own Tangata Restaurant. I had their Cream of Cauliflower soup and their "Crispy Calamari," which is fresh Monterey squid dipped in a sauce of Espelette pepper, pickled peppers, and a Thai eggplant pur�e. Judy had their "Tangata Burger" with Cheddar Cheese, aioli sauce, onion, lettuce and tomatoes. For beverages, we each had a Chinese beer called "Laughing Buddha." Sometimes the lunch makes the adventure and today it was true. Today we had a special treat since we were invited to the 21st Annual "Agave Roast" at the Malki Museum in Banning. It was a very interesting experience for both of us. For pictures, click here. Our friends from New Hampshire, Olga and Mark Farrell, were in San Diego this week so we decided to meet them in Encinitas to see the San Diego Botanic Garden. 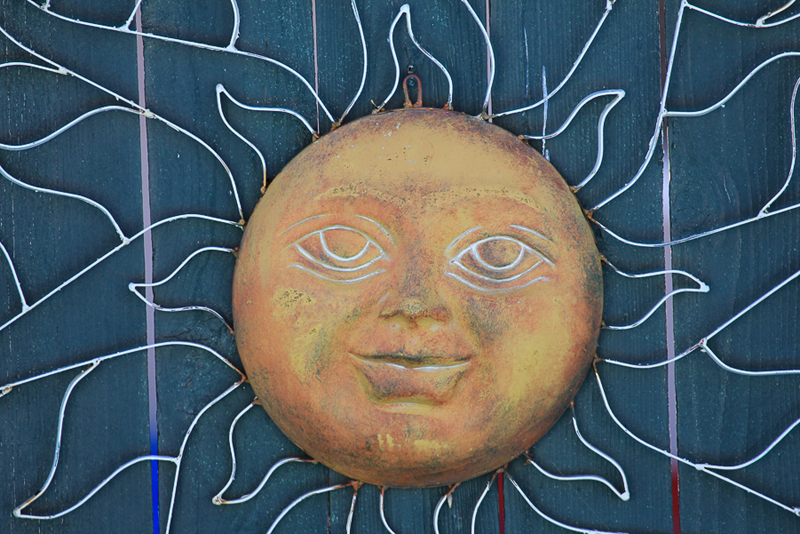 Although there was a threat of rain, the clouds gave way to the sun so that we all could enjoy a beautiful day together. For pictures, click here. 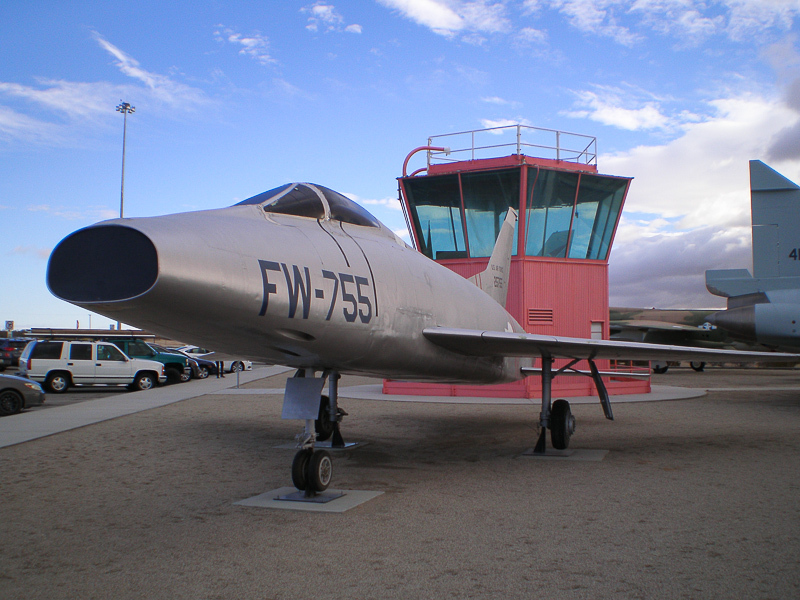 Today we headed over to Chino to visit the Planes of Fame Air Museum, which is the best aircraft museum that we have seen in SoCal. Driving there was fun since the airport seems to be surrounded by dozens upon dozens of dairy farms. For pictures, click here. Today we had a great adventure that just kind of happened. We had planned to see the National Parks Adventure movie at the IMAX in Los Angeles, but we ended up being dazzled by everything in Exposition Park. For pictures, click here. Today we were back in Palm Springs to see the new exhibit at the Palm Springs Art Museum, "Edward S. Curtis: One Hundred Masterworks." Beginning in 1900, Edward S. Curtis (1868-1952) set out on a monumental quest to create an unprecedented record of the Indians of North America. The culmination of his 30-year project led to his magnum opus, The North American Indian, a twenty-volume, twenty-portfolio set of handmade books containing a selection of over 2,200 original photographs. Unfortunately no photography was allowed for this exhibit. However to get an idea of what we saw, click this link to see some Google images of Curtis' work. After the museum it was time for lunch at a new place for us, Spencer's Restaurant, in Palm Springs. It is located at the base of the San Jacinto Mountains and it has a wonderful atmosphere and great food. For her appetizer Judy had their "Three Onion Soup," a gratin�e with gruyere cheese and garlic croutons. I had their "Chilled Gazpacho" with Maine lobster, vine ripened tomatoes, yellow peppers and a cucumber essence. For our main course we split their appetizer sampler, which included three dishes: "Lobster Potstickers" with cilantro, soy sauce, chili aioli and a Sriracha sauce, "Chinese Style Kung Pao Calamari" tossed with cilantro and their sweet and spicy chili sauce and finally, their "Fried Coconut Crusted Shrimp" with Hawaiian sugarloaf pineapple and a sweet chili glaze. For dessert we split a slice of their silky, satin chocolate cheese cake with a white chocolate topping, fresh strawberries and their delicious whipped cream. Lunch was unbelievable! 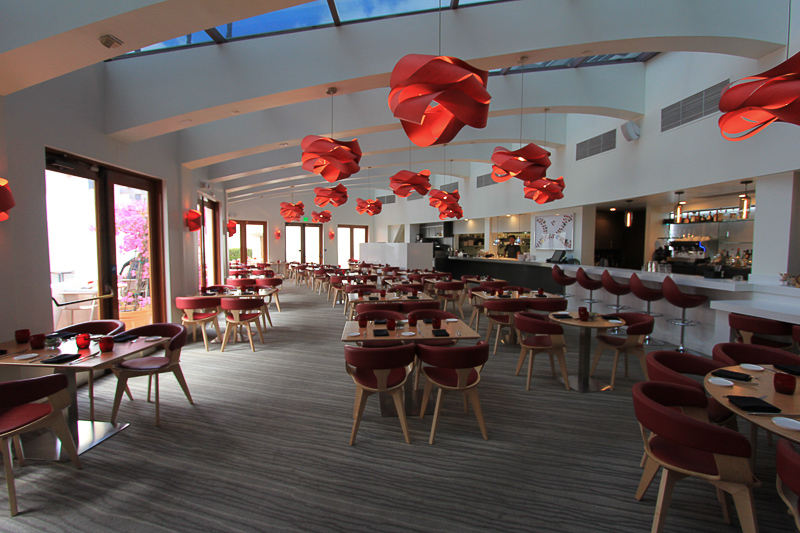 Spencer's is located within the Palm Springs Tennis Club complex and everything about it is top shelf. It was quite an experience! Today we did something a little different. We went horseback riding in Griffith Park at the Sunset Ranch. For pictures, click here. Today we drove south to visit the Anza-Borrego Desert State Park. There had been a little rain down there so we were hoping to see some desert wildflowers. We weren't disappointed. For pictures, click here. 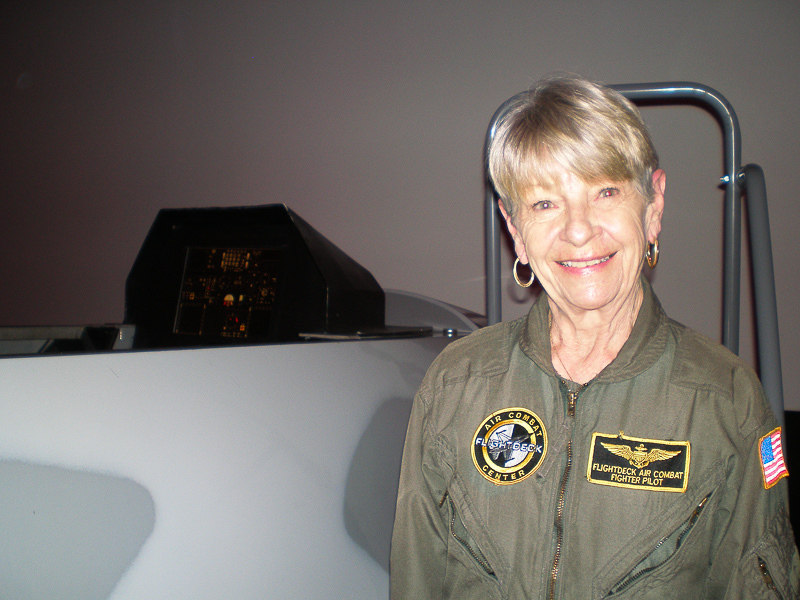 We tried something new today, we went to the Flightdeck Air Combat Center in Anaheim to experience air-to-air combat in authentic military flight simulators. It was quite an experience! We had about 40 minutes in the simulators after receiving flying instructions from the staff. We only had about 10-15 minutes to warm up on how to fly an F-16 Falcon and then our fighters were "armed" with missiles and guns for the dog fights. There were a dozen fighters each trying to bring down each other. What a blast! Kills were especially exciting. 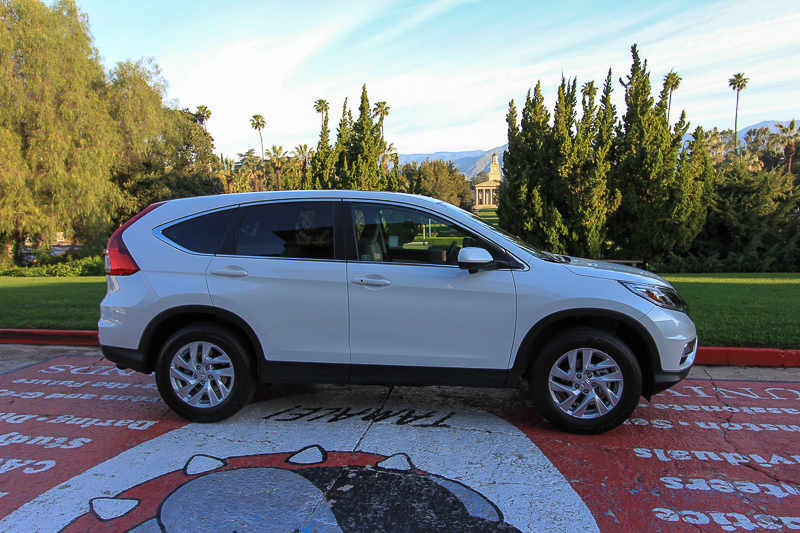 We picked up our new 2016 Honda CR-V two days ago and we're very happy with it. Here it is on the campus of the University of Redlands with the Memorial Chapel in the background. 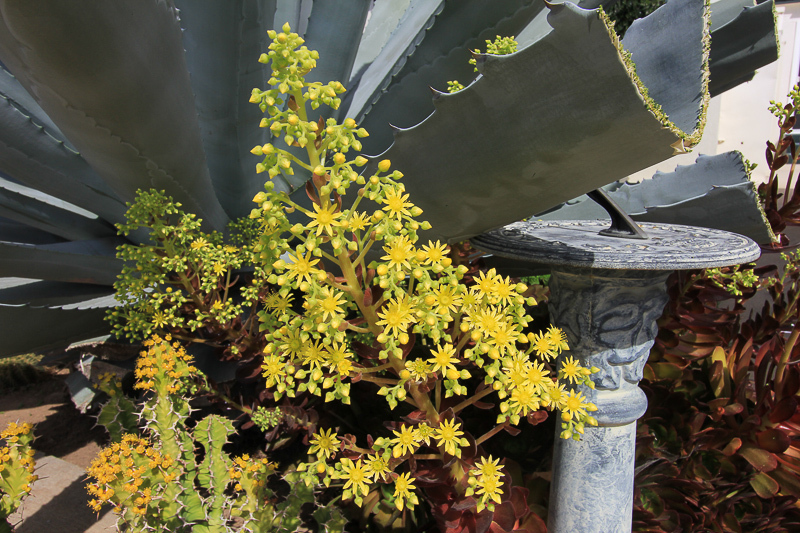 One of our succulents in the backyard has never bloomed until this past week. Unfortunately I don't know the name of the species, but it is beautiful. We drove south to Lake Forest today to visit the Heritage Hill Historical Park and we had a great time there. It's so nice that some people have taken the time and money to preserve historical buildings from the past. For pictures, click here. Today we were in Pomona to visit the American Museum of Ceramic Art. While we enjoyed the contemporary pieces, what really fascinated us was their collection of Mettlach ceramics. For pictures, click here. We had a great time today taking in the Modernism Week Show and Sale held at the Palm Springs Convention Center. For pictures, click here. Today we drove to Pacific Palisades to see the Eames House. It was a beautiful day, with temperatures in the eighties, which was perfect for our tour. For pictures, click here. We had a beautiful drive today going south into the Anza Valley to see the Hamilton Museum. For pictures, click here. Our Honda is in the shop so we traveled close to home today in our loaner car. The Riverside Art Museum is always a treat and that was true again today. For pictures, click here. Our very pleasant adventure today was to visit the Moorten Botanical Gardens in Palm Springs. What a great place it is! For pictures, click here. Our "Sticks-on-Fire" plant in the backyard has put on a very dramatic display this winter. For pictures, click here. Today we had a long day going to Edwards Air Force Base for a tour. Although we learned a lot about the base and what they do there, the tour was four hours long and not that interesting. It could have been a lot shorter for what we saw. We did see quite a few jets taking off and going through their maneuvers, which was fascinating since they're so fast and so loud. No photography was allowed on the base. 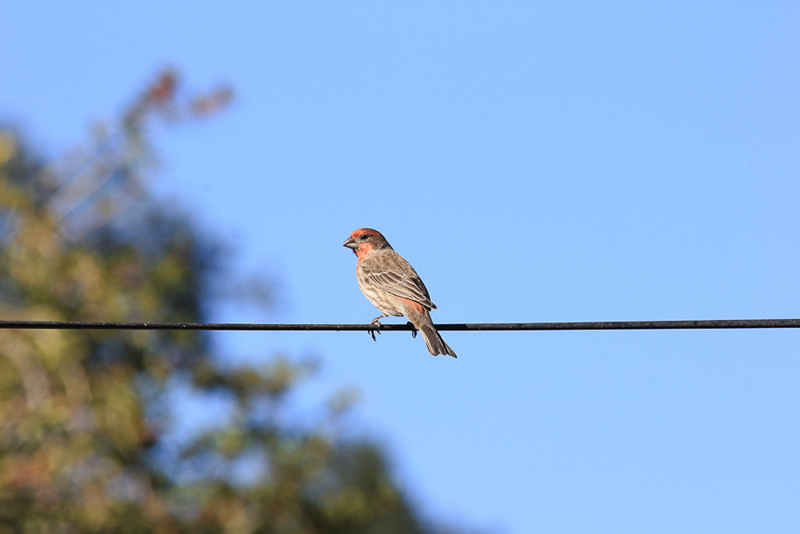 I bought a new telephoto lens a couple of weeks ago but I didn't have a chance to play with it until today. As long as I have enough light, I won't need a tripod to use it, which is great! 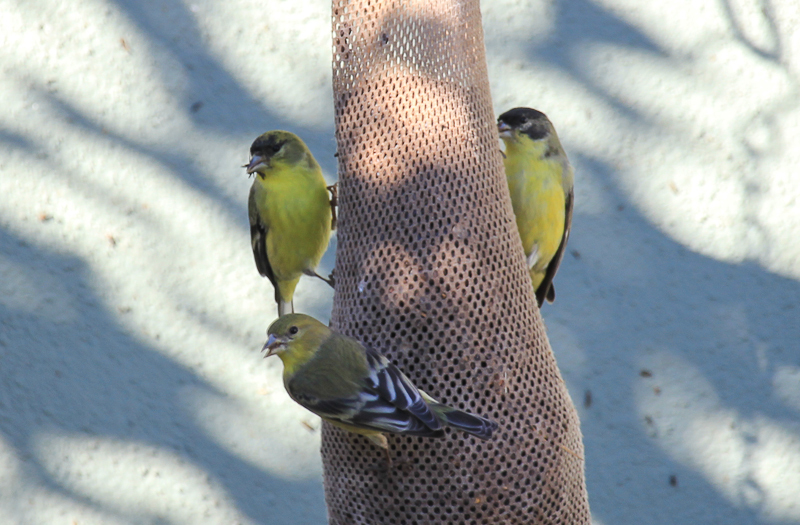 Here are two shots I took in the backyard. We were in Tustin today to see the Marconi Automotive Museum. It is stunning with over 70 exotic automobiles in breathtaking condition. For pictures, click here.